“Our heritage is deeply rooted in product innovation. We’re always pursuing ways to make our products even better – and ultimately, enhance the outdoor cooking experience,” said Russ Faulk, chief designer and head of product for Kalamazoo Outdoor Gourmet. The original Kalamazoo Gaucho Grill – released in spring 2015 – brought modern luxury and convenience to the time-honored design of Argentine-style wood-fired grills. The 2016 version of the Gaucho features a substantial improvement focused on ease of use. The ratchet mechanism has been eliminated to enable one-handed raising and lowering of the grill grate and motorized rotisserie spit. The grill’s high-powered gas starter system easily lights a wood or charcoal fire in fewer than 10 minutes. Advanced airflow helps start the fire more quickly and delivers efficient heat. Simply arrange the cooking wood on the fire grates, ignite the burners and a roaring fire will soon be ready. A 726 square-inch cooking cradle carries interchangeable grill grates specially designed for meat, fish or vegetables. The same cradle also holds the rotisserie spit. The motor is built into the grill, and the spit moves with the cooking cradle, operating at any height above the fire. An ash collection system eliminates the mess and the need to shovel ash out of a traditional fire pan. As wood or charcoal burns, the debris falls through the grates, past the burners, down the funnel and into a stainless steel cleanout bin. Kalamazoo also expanded its Artisan Fire Pizza Oven collection with the launch of a freestanding version. This new model is designed for backyard cooks who enjoy making pizza, but also need more flexibility in their outdoor living space. 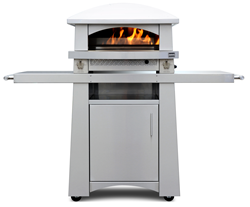 Available for natural gas (52,000 BTUs) or liquid propane (35,000 BTUs), the stainless-steel freestanding Artisan Fire Pizza Oven (AFPO-T) joins the countertop (AFPO-C) and built-in (AFPO-B) versions. It features the same unrivaled cooking performance as the other models with the added convenience of resting atop a compact, wheeled cart. The storage area of the cart accommodates – and discretely hides – a liquid propane cylinder. Above that, a pair of shelves flank the oven, providing added workspace, while another small shelf below keeps pizza-making essentials close at hand. Like the other Artisan Fire Pizza Oven versions, the freestanding model is stone-lined and mimics the cooking capabilities of a traditional wood-fired pizza oven. Two independently adjustable burners deliver temperatures from 250°F to more than 800°F, with heat that can be tailored to different pizza styles, as well as breads, meat and fish dishes. Baking a Neapolitan-style pizza takes fewer than three minutes at full heat. Hand built at the time of order in the Kalamazoo area of Michigan, the Gaucho Grill and freestanding Artisan Fire Pizza Oven are now available through kalamazoogourmet.com, select dealerships throughout the United States and Canada and certified design professionals. The Gaucho is available in two freestanding models and a built-in version. To find the nearest showroom, visit the dealer locator on the Kalamazoo website. 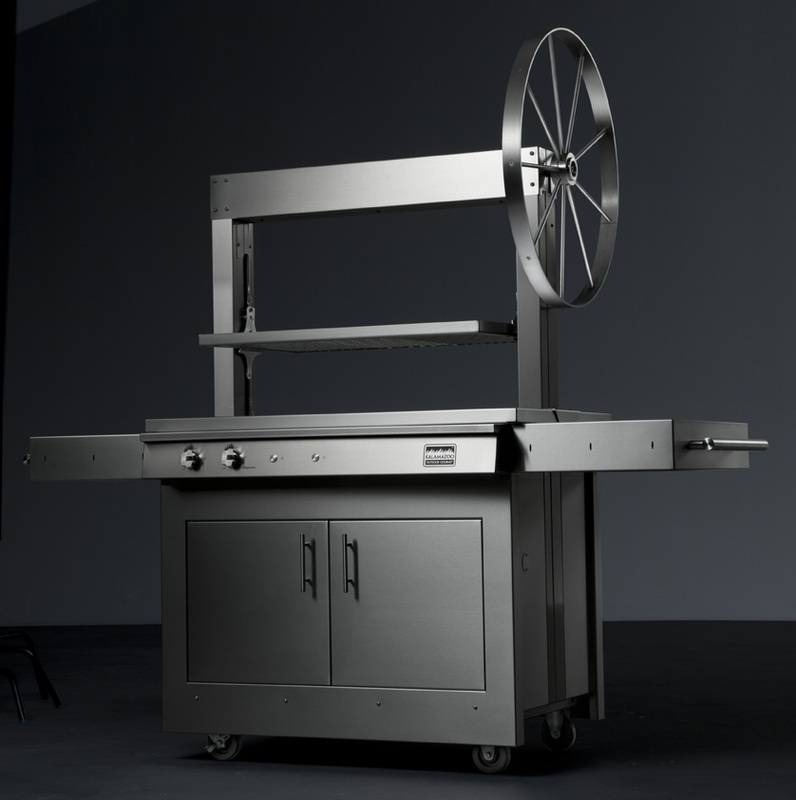 EDITOR’S NOTE: To learn more about the Gaucho Grill or freestanding Artisan Fire Pizza Oven, request high-resolution images or schedule an interview with Russ Faulk, chief designer and head of product, contact Brad Carlson at 312-423-8703 (office), 630-915-1414 (mobile) or bcarlson@kalamazoogourmet.com. Kalamazoo Outdoor Gourmet builds outdoor kitchen equipment – exclusively. We are committed to developing industry-leading products that will elevate the outdoor cooking experience for our clients. 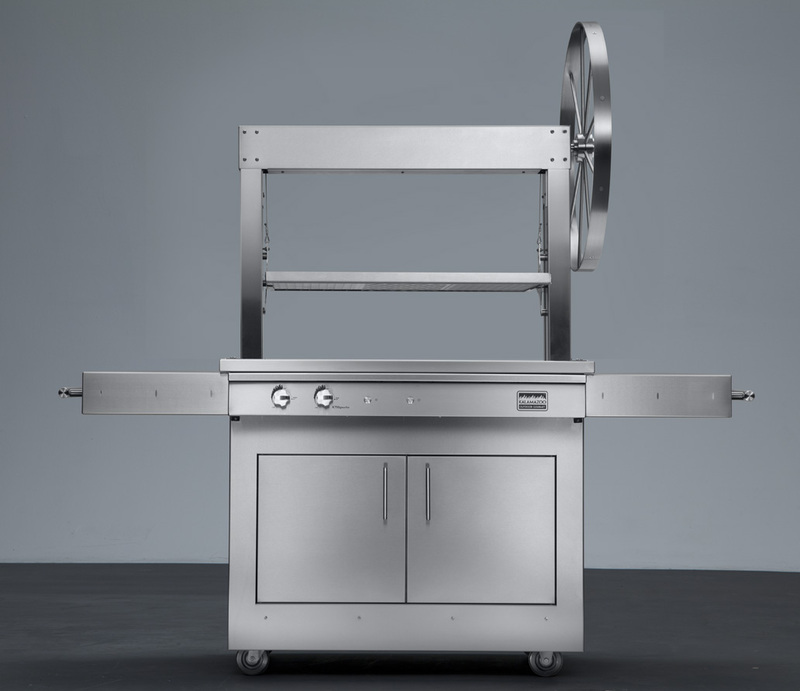 Whether you’re an award-winning chef or an avid backyard griller, we’re dedicated to providing exceptional craftsmanship that’s reflected through the superior quality of our stainless-steel products meticulously built by hand in Michigan. From the unmatched cooking versatility of our Hybrid Fire Grill to the high-performance heating capabilities of our Artisan Fire Pizza Oven, our products are available through our website, certified design professionals and select dealerships throughout the United States and Canada.